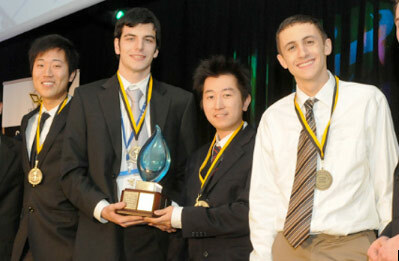 U of T Engineering’s Junior Design Team won first place in their category at the 2010 Ontario Engineering Competition. Pictured from left to right: Jay (Ji) Zhou (EngSci), Michael Del Balso (ECE), Zongyi Yang (EngSci), and Colin Merkel (EngSci). The Ontario Engineering Competition allows local undergraduate engineering students to showcase their talents under the pressures and constraints of competition. Hosted this year by the University of Waterloo, the theme of the competition was Redefining Engineering, where real-world feasibility, viability and sustainability were important aspects of success. Teams competed for cash prizes, special awards, and the chance to complete nationally at the Canadian Engineering Competition. “The calibre of debate was very impressive this year,” says Raj Pattani (MIE), who teamed with fellow Fourth Year student, Elika Mahdavi (MIE) in the Parliamentary Debate category. Parliamentary Debate encourages competitors to present well-reasoned viewpoints with minimal preparation as a reflection of what is often required of engineers in their day-to-day roles. Competing teams were asked to evaluate and argue for or against a variety of real-world statments “Be it resolved that engineering research does more harm than good” and abstract statements “Be it resolved that happiness should not be pursued”. For Michael Del Balso (ECE), Second Year student and team captain of U of T Engineering’s Junior Design Team, the competition was a lesson in effective teamwork. At the event, Del Balso’s team built a small vehicle that successfully transported miniature logs over an obstacle course. They were allowed four hours from start to finish, a budget to purchase materials on-site, and tools to use on a first-come-first-served basis. Having participated previously in the Ontario Engineering Competition and University of Toronto Engineering Kompetition (UTEK), Del Balso brought wisdom and experience to the team. “Many teams rush into building without a proper plan and get hit with unexpected roadblocks that impact their designs negatively. A properly implemented design process is always effective, no matter the size of the project,” says Del Balso. They took time to plan their design. Theirs was the only vehicle in the category to operate. The Faculty will continue to support the Junior Design, Parliamentary Debate and Innovative Design Teams as they compete against top teams from the Ontario, Atlantic Canada, Western Canada and Quebec engineering competitions at the Canadian Engineering Competition being held at the University of Toronto from March 18 to 21, 2010. For more information about the Canadian Engineering Competition, please visit www.cec2010.ca.